In today’s world, power distribution networks deploy an array of protection equipment, power quality analysers, revenue meters and other monitoring equipment to ensure high quality and reliable power flow as well as energy efficiency. Therefore, the ability to analyse synchronised data from a variety of data sources within one system is essential in order to meet today’s highest level of reliability, quality and energy efficiency and bring it into the future. 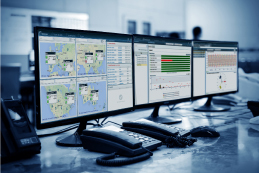 PQSCADA Sapphire’s multi-vendor support sets new standards for power monitoring management software. This unique feature enables the gathering and analysis of all field generated data on a central software solution, regardless of IED manufacturer. PQSCADA Sapphire is an expandable platform - further capabilities can be easily added later with add-ons, or developed independently through the use of API to meet your custom needs and applications. Elspec PQSCADA Sapphire allows all Fault Recorders, Power Quality Analysers, Revenue Meters and all other IED to be analysed in one system. System: Green as long as the measuring device is at operation condition. Power quality: the power quality widget displays a list of measurement points that are in violation of preconfigured grid code. A link to map or investigation is available for quick access. Disturbances: the disturbances widget displays a list of short predefined events that have happened during the last hour/day/week/month. A link to map or investigation is available for quick access. System: the system widget displays a list of system messages/warnings about operation condition. A link to system module for further investigation is available. The power quality module shows at a glance the status of the entire network or individual measurement points for a selected period of time. The power quality conditions are configurable and can meet any grid code. Multiple compliance conditions can apply to a single measurement point for comparison. A comprehensive report, based on the power quality compliance conditions, can be easily generated from the power quality module. customizations from simple end user configurations to XAML styling and full coding. The PQSCADA Sapphire PQ investigation module offers numerous chart types to choose from such as column/bar, stacked column/bar, multi-level pie, line, curved line, scatter plot and curved area. It calculates 5,000 different power quality parameters based on the capture waveform and many other great features. The investigation module graphically presents trends, histograms, events lists, summary tables, and statistical summaries of any stored parameters. It allows the user to analyse voltage sags/dips, swells, interruptions or any other incident. Each investigation includes multiple views and charts that can be easily exported to MS Word with predefined templates, a PDF file or to be stored as an image on your computer. Sharing an investigation between users of the system can be done with a single mouse click. PQSCADA Sapphire Multi-site investigation allows you to simultaneously view data from many different sites or instruments, to compare data from various locations or times in the same chart. PQSCADA Sapphire’s unique capability to store continuous waveform recording from PQZIP enabled devices or temporary events recording from standard meters using COMTRADE and/or PQDIF file formats makes Event Analysis comprehensive yet easy to achieve. Sophisticated event detection capabilities enable the user to configure events of any measured parameters and/or IO ports. The event mechanism supports out-of-limit events as well as rates of changed limits. Events can be configured with multiple thresholds and conditions with multiple parameters. Another feature of the event mechanism is the ability to aggregate multiple events with logic operation between them. The PQSCADA Sapphire will find events according to user defined thresholds during post-processing. Gain the most useful insights out of your data. PQSCADA Sapphire has a unique set of charts and reports empowering your ability to plan, control and make data-driven decisions. Get an overview of your electrical network and measuring devices geographically. This feature will provide a simple solution that delivers powerful Power Quality Data. Reports are created in CSV/Excel that includes parameters selected by the user, based on either a schedule / event, at any desired resolution. Apart from the strong compatibility of these file exports, the user defines the parameters & resolution settings thereby determining the size & speed at which the file is produced.Graphical Data - Fault graphs, voltage & current waveforms, & the distance graphs. By combining Elspec’s Time of Use (TOU) file with the amount & makeup (Active or Reactive) of the Net Energy produced/consumed by a site, you can now easily calculate the energy produced/consumed by a site in a TOU calendar profile. The Transient report includes the source, time of occurrence, duration & deviation to the threshold of all the transients occurring within any pre-selected site & configuration. EN50160 COMPLIANCE REPORT - Report that includes the limits, values & characteristics of Voltage at a Network User's Supply Terminals, according to the EN50160 Compliance.